I will like to start this post with these questions, how many of you have ever thought of given consideration to banana blossoms? Are you aware of the amazing health benefits it has to you as a human? I am sure i will have more of a NO answer compared to that of YES. We all love bananas because of its sweet taste and a wholesome pack of health benefits it has, but i will love to bring the knowledge to you that the blossoms of this superfruit also have lots of health benefits in stock for you. A banana plant is an external source of nourishment because of the vitamins and phyto-nutrients it contains, and also it brings joy because of the fun derived from eating it. Every single part of the plant, be it the fruit, leaves, stem or flowers, is packed with tremendous health benefits and medicinal uses. We are all aware of the nutritional value of banana, and also looking at the banana blossoms, you will discover that there is no exception too. The banana blossoms is rich in vitamin E and flavonoids. These beautiful purplish-red flowers have immense medicinal values and offer amazing health benefits. Banana blossoms are also rich in dietary fibres, unsaturated fats and proteins. Below are some of the amazing health benefits of banana blossoms. Banana blossom is one best remedy for women that are experiencing excessive bleeding. Eating a cooked banana blossom together with yoghurt and/or curd stimulates the progesterone hormone in the body and reduces bleeding. Banana blossoms have the ability of curing anaemia and diabetes. regular consumption of this banana flower reduces your blood sugar levels and maintain insulin levels. 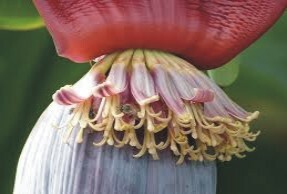 The fibres of banana flowers is rich in high iron content which help in the production of red blood cells. These red cells in return, increases the haemoglobin level of the body. Banana blossoms are highly effective in the treatment of infections. The ethanol based extracts of the flowers hinders the growth of pathogenic bacteria. The presence of high magnesium content in the banana blossom makes it a perfect mood booster. It is one natural way to optimally promote moods and help fight depression. In this recent times, many new mothers are finding it difficult to supply adequate amount of milk during breast feeding. Banana blossoms boost the supply of milk which enables lactating mothers to adequately feed their babies efficiently. If you find this post informative, feel free to share to as many that are yet to know the about these amazing health benefits of banana blossoms.